Raising a European Starling as a pet is no small chore. What follows is a collection of thoughts, research, and insights on bird health that may assist you in your efforts. This document will continue to be updated over time. It’s very difficult to identify illness in birds. They’re good at hiding their symptoms, the theory being that this helps them to avoid being prey to predators. Beyond behavioral changes, one correlation with illness is a bird’s weight. Given their small size, it’s easier to use grams (g). Weighing your bird once every 2-4 weeks should give you an idea about any health issues. Since birds hide their illness, by the time they start showing behavioral symptoms it can often severe, or too late, at that point. We set up a calendar reminder for every two weeks. Keep a record of the data (we use an all-day calendar entry on our phone labeled “Bird (weight)” for your reference; your vet may need this in order to track the progression/speed of any illness. You can use a digital kitchen scale that has a tare option in order to reset the weight to zero if you use a bird stand or small container for the bird to sit/stand in. 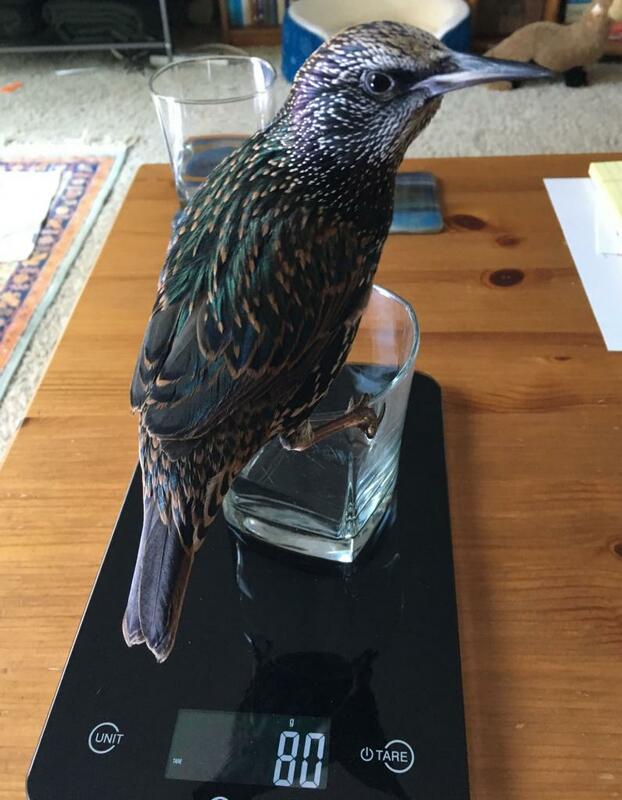 Since your bird may not want to stand directly on the scale, you can get a small bird stand or, more easily, just use a clean bowl or glass for them to perch on the edge of. Side-note: To make things easy, when dosing medication for a European Starling, many vets use a standard assumption of 100 grams for the bird, regardless of weight.